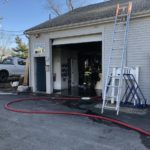 On Friday January 11 at approximately 1:00 p.m. the Brewster Fire Department was dispatched on a line box assignment to a commercial structure fire located at 92 Rayber Road in Orleans. Ladder 237 under the direction of FF Michael Herrmann, Ambulance 242, and Car 231 (Chief Moran) responded to the scene. 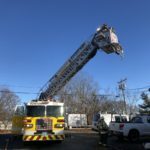 On arrival Orleans firefighters found fire emanating from a window of a 25’ x 150’ single story commercial building occupied by a variety of single unit businesses and contractors. One 1 ¾ attack line was quickly stretched into the unit to extinguish the fire and limit any extension to other units in the facility. At the scene, Brewster firefighters assisted in forcible entry, checking for fire extension, and ventilating the building.